Award-winning audio converting and merging software. * Change settings of each audio file: Frequency, # channels, Bitrate, VbrQuality, etc. Audio Merge Expert is able to merge separate audio files into one big file without quality loss. It allows you to input audio files of the same/different formats and everything will be done in a split second. It's a perfect assistant for users who love enjoying audiobooks but feel interrupted by the pause and clip between each chapter. 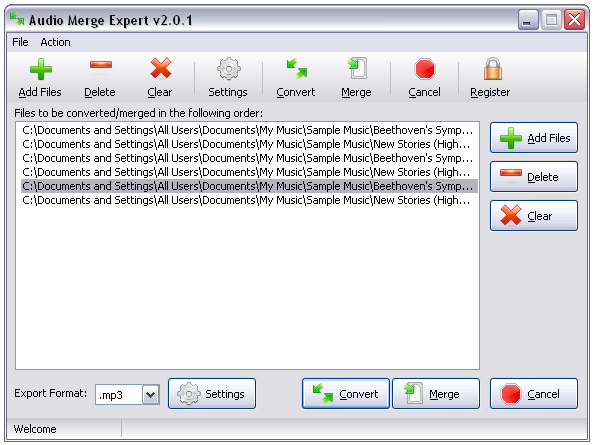 Another main function of Audio Merge Expert is to convert audio files. Just input the audio you need to convert and switch the mode to "Convert". Batch conversion is provided, that means you can add thousands of audio files. Now you can enjoy the joined music or any other audio files in your portable devices. Record most video/audio items playable by Windows Media Player?. seo expert, your specialist.Go farther with seo expert. Qweas is providing links to Audio Merge Expert 4.0.6 as a courtesy, and makes no representations regarding Audio Merge Expert or any other applications or any information related thereto. Any questions, complaints or claims regarding this application Audio Merge Expert 4.0.6 must be directed to the appropriate software vendor. You may click the publisher link of Audio Merge Expert on the top of this page to get more details about the vendor.